The year was 1999, and Mariah Carey released her first studio album on Sony post-divorce. Her last album, her magnum opus Butterfly found Mariah at a creative peak, liberated but heartbroken. The tone of Rainbow was a bit different. Its concept is simple: after every storm, a rainbow – a beautiful, new beginning – appears. For this time in her life, this concept was all-too apt. “Thank God I Found You” was the second single from the album (released in January of 2000) and followed in the footsteps of lead single “Heartbreaker” – it became yet another #1 hit for the diva, her 15th. It also secured Mariah her 11th straight year of #1 singles – she had had one every year from 1990 until 2000. Of equal significance, the song was also the final track on Rainbow and follows the title track (interlude). In that interlude she sings, “I know there is a rainbow for me to follow to get beyond my sorrow, thunder precedes a sunlight, and I’ll be alright, if I can find that rainbow’s end.” The love ballad follows, symbolizing finding true love at the end of a stormy time. Otherwise, the song kind of falls short. Most fans agree that it is their least favorite in Carey’s long list of #1’s. It is an unremarkable ballad, with an unsurprisingly impressive vocal from Carey. The song features vocals from R&B crooner Joe and pop boy band 98 Degrees. Although the combination is still worth note – it is one that would have only happened in 1999. The late 90s and early 2000s were an interesting time for Pop music. Of course, commercially, it was perhaps the industry’s golden years. Music sold like hot cakes and pop-tarts like Britney, Backstreet Boys, *NSYNC, etc. took over the scene. At the same time, big-voiced divas like Mariah, Whitney and Celine still had a stronghold on radio. Crossover R&B solo acts like Brandy and R. Kelly, or groups like Destiny’s Child and Next flourished too. “Thank God I Found You” by Mariah Carey, Joe and 98 Degrees encapsulates this moment in Pop music history better than perhaps any other song. It’s a vocal diva, an R&B male, and a pop boy band singing a clichéd piano-driven love ballad. What better sonic time capsule of the late 90s can you ask for? Well, Mariah has an answer for that question, too. 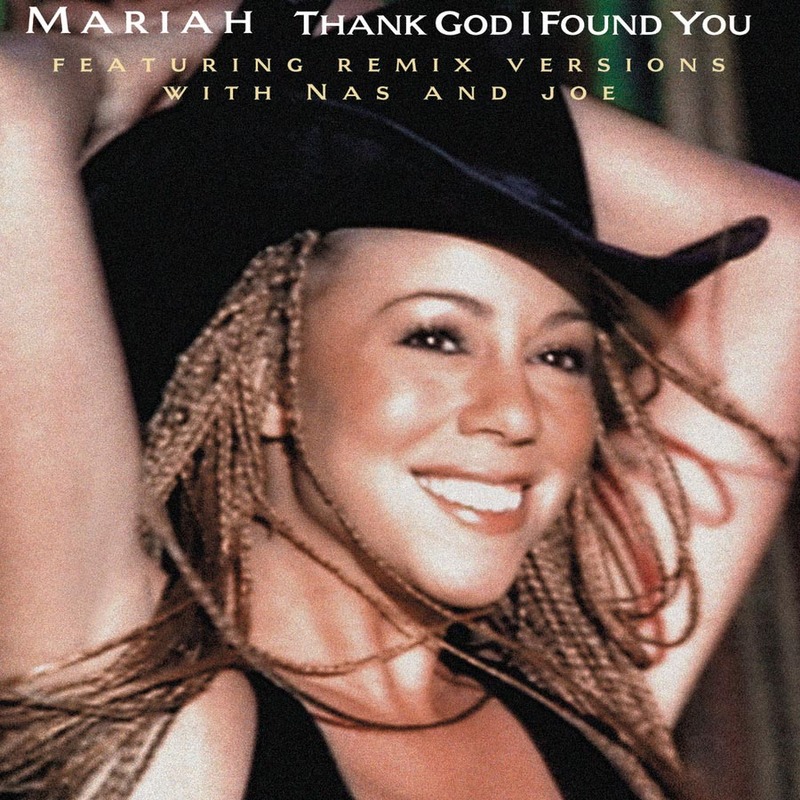 There was another genre untouched by “Thank God I Found You” – a favorite of Mariah’s – hip-hop. The song’s R&B remix is actually a re-interpretation of Keith Sweat’s 1988 single “Make It Last Forever.” More or less, it is a cover, with a retooled instrumental (helmed by DJ Clue). Some alterations to the lyric to include “thank god I found you” references – and a rap from hip-hop icon Nas. Since 1995, Mariah had been an innovator, known for her ability effortlessly combine pop, R&B and hip-hop in her songs and remixes. The “Make It Last Remix” of “Thank God I Found You” is no different. Collaborating with Nas (and again with Joe) for this cover-of-a-quiet-storm-R&B-ballad-as-a-remix-of-a-pop-ballad-featuring-an-iconic-rapper is distinctly, uniquely Mariah. None of her peers dared. The original may have been long ignored by fans and even by the diva herself. However, its remix made “Thank God I Found You” last forever indeed. Recently, Mariah has been inadvertently forced into performing the song as part of her #1 to Infinity Las Vegas residency, staying true to her commitment to perform all 18 of her #1 singles. Perhaps in part due to its duet structure, its relative irrelevancy, or her lack of interest in the song, she has significantly “remixed” (and shortened) the song for the live performance. She does only her solo verse and its chorus – acoustically with a jazzy flare – but it is wonderfully gorgeous. See below. It is great to see that she has found a way to breathe new life into song that otherwise sounds so dated and unremarkable. Many were surprised she didn’t just opt to perform the remix, but hey – thank God she found this arrangement because it is fantastic. So, for that, and for the sheer fact that the song is essentially a time capsule of late 90s Pop music, an encapsulating amalgamation of pop balladry, soulful R&B, “bubble gum” pop, and quality hip-hop, we appreciate “Thank God I Found You.” Hopefully, you might have gained a new appreciation for the song now, too!